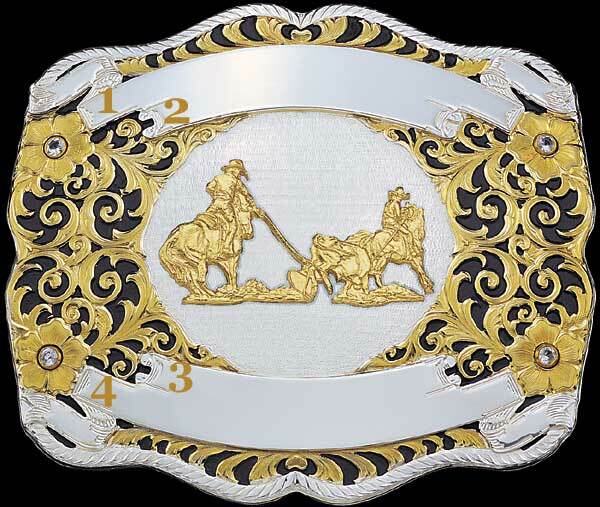 Award Buckle 60530 by Montana Silversmiths. 3½" x 4". Your choice of background colors; shown here with Midnight Black. Your choice of stones; shown here with cubic zirconias. Four engraveable ribbons and the figure of your choice. Shown here with team roper figure #857. This award buckle is also available in solid sterling silver (usually price x 3); contact us for a quote. Download the Catalog of Figures here. This Award Buckle is also available with an Antiqued Patina.